Between 1905 and 1907, Kleitsch produced a number of still life paintings depicting clustered fruits and cosmetibles, where his vibrant experimentation in color emerged as a signature element of his work. Using the simple format of placing objects parallel to the picture plane, Kleitsch’s early work recalls artist Raphaelle Peale’s “dining room” paintings of the early 1800s. 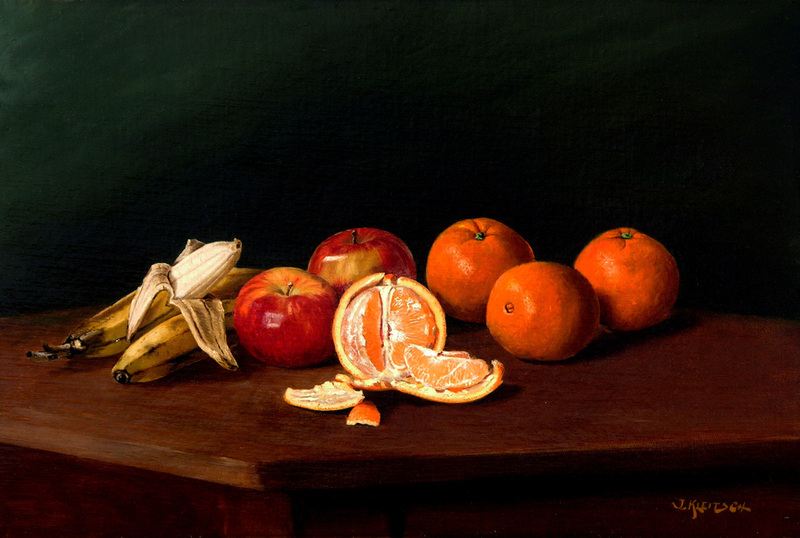 Kleitsch would practice still life painting throughout his career, developing his technique over time by adding increasing detail in his compositions and depicting new objects. In the years of his residence in Laguna Beach, Kleitsch captured his still life studies with an immediacy of brush stroke and bold, sensual use of color. Particularly attracted to Orientalism and patterning, he often set cool, hard lacquerware and figurines against fluid silks. Other ornate details emerge in textured, fringed fabrics and embroidered textiles. A distinctive Kleitsch trait is his use of scarlet paint, most notably in his portraits and still life works. The color, thrusting the painting’s focal point to the foreground, is contrasted by soft blues and greens behind it. Kleitsch experiments with temperature and draws viewers in with red hues, before finding rest in cool elements of blue porcelain or green jade using objects such as a turquoise Buddha figure.